LENEXA, Kansas, August 30, 2013 – ExamOne, a leader of laboratory testing, underwriting and paramedical services to the life insurance industry, is supporting Life Insurance Awareness Month, organized by the Life and Health Insurance Foundation for Education (LIFE). During the month of September, the LIFE Foundation is highlighting the need for financial security among America’s households and the role of life insurance in meeting this need. 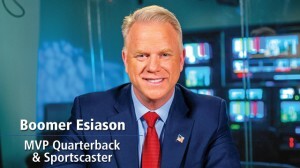 The LIFE Foundation is featuring Boomer Esiason, former record-setting NFL quarterback and current Sportscaster, as part of this year’s campaign. Esiason’s mother died without any life insurance when he was only 7, leaving his father to care for his family alone. ExamOne has been dedicated to simplifying the process for the applicant and is the first in the industry to have a website devoted solely to the applicant. This website offers tips and a video on how an applicant can prepare for their paramedical exam, answers frequently asked questions and provides instructions on how they can obtain results of laboratory testing performed on them through its product, Inside Look*™. Previous post: State of the Life Insurance Industry: Who decides?